The latest offering from Rogue Productions, Lamplighters is part theatre, part game, part interactive comedy. 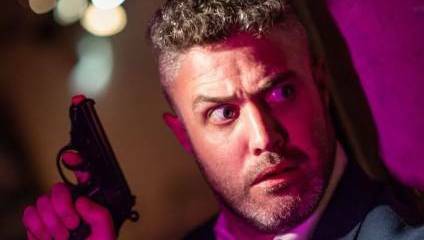 Performed in the Old Red Lion Theatre in Islington, the audience becomes part of the action, as you embark upon your very own operation with the secret service led by George Sneezy, played by the ebullient, comic and charming Neil Connolly. There’s no pretence of being in a theatre, as sole actor Connolly breaks down the fourth wall as soon as you enter the space. He chats as himself and asks you about your expectations for the evening before the show even starts, and subsequently begins the performance by describing his love of John Le Carré novels, and his lifelong dream of being a spy. Obviously this ambition hasn’t materialised, so Connolly charmingly asks if you will help fulfil his childhood dreams, and play spies with him. And so the show begins. Play is the key word here, as Connolly leads you through a theatrical, childlike adventure that really requires your imagination. Unlike many other immersive experiences that use extensive set and special effects to get you in the zone (such as our friends at Culture Calling who recently experienced the Zombie Apocalypse in an authentic abandoned shopping centre), Lamplighters is set in the tiny black box Old Red Lion Theatre, and has a very low budget set. However, this is what creates the whole charm of the production, as it takes you back to your childhood, utilising whatever you can around the room to fuel your makeshift game. To complete “Operation Breadstick” (or whatever name you and your fellow audience members have chosen) and identify the mole in your midst, you must complete a series of “missions” or games that are orchestrated by Connolly, or should I say Agent George Sneezy. The audience members take on different roles, from the house band who have to attempt to provide “film noir jazz like sounds” with a trumpet, child’s drum kit, keyboard and little expertise, to the “lamplighter” who is provided with chalk to write recognisable symbols on the walls before every spy meeting to signify the area is safe. But, don’t panic! George Sneezy doesn’t assign anyone a role unless they volunteer, so introverts can still enjoy the show from a safe distance… but we’re pretty sure it’s more fun if you join in – we were particularly sad we didn’t get chosen to dodge the 8 layers of security at the end of the show, dodging between moveable spotlights and security guards with torches in a challenge reminiscent of the Crystal Maze. It is especially important to volunteer as well if you want to get the firmest grasp on the plotline, as you lose some of the details when you don’t get involved (there are many secret notes and messages that you don’t get to read unless you are chosen for a role). It’s all very funny, and the hilarity is heightened by the fact the jokes are unique to your show. Collectively, the audience have forged the plotline and hence the comedic direction, and the people on stage enacting the humorous scenes are your friends that you came with, the guy you were sitting next to, or enjoying a pint with before the show. It’s amazing to see how much people get involved, and at times one begins to question if maybe there are some planted actors in the audience. But no. Neil Connolly has just expertly set the scene and created a safe space to allow these busy Londoners from all walks of life, to forget their day job in Canary Wharf and harness the power of their imaginations, that may have been out of use since childhood. Lamplighters is running until 18 August at the Old Red Lion Theatre, 418 St John Street, London, EC1V 4NJ. You can also read our interview with actor Neil Connolly and Director Dean Rodgers. Read our interview with actor Neil Connolly and founder of Rogue Productions, Dean Rodgers here.